In Languedoc, high up on the schist and sandstone soils of the Larzac plateau, cool summer nights help wine grapes mature slowly and steadily. Nearby, sheep bred for the production of Roquefort cheese graze serenely. Up the road, folks living in the quiet village of Saint Privat go about their daily routines. It’s here in this idyllic setting that four vignerons and winemaker Jean-Baptiste Granier are producing a charming and delicate wine. 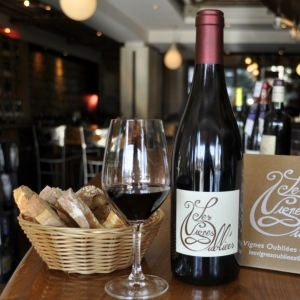 Les Vignes Oubliées has a nose of mixed berries on top of subtle notes of pepper and dried herbs. A sip is balanced through a range of fresh fruits across silky tannins and then all rounded in the end with a packet of spices. Though drinking perfectly well presently, these bottles promise to age gracefully for a decade or more.